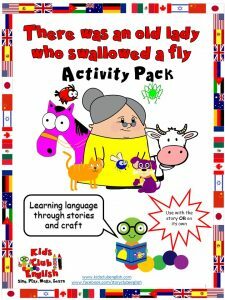 Kids love learning about animals, no matter the language. 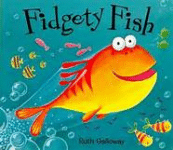 Help children acquire and learn animal vocabulary through these fun animal stories, songs and crafts. 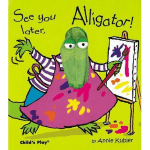 On this page you can find our Animal Songs collections, Animal stories, Crafts and Printables related to the animals topic, Powerpoint games and Powerpoint stories. 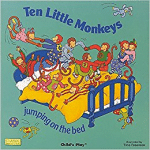 The collections below are divided into different groups: pet songs, sea animals songs, jungle animals songs and farm animals songs. Choose your favourites from the galleries below or use the playlists to let the songs run continuously. 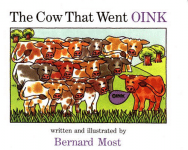 The following story-related resources can be used to develop language related to animals. 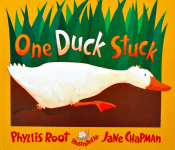 Depending on the story, you can work on other topic related vocabulary too. 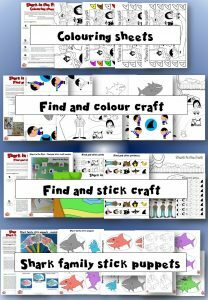 All resources can be used independently of the books or complemented with a video from our storytelling videos. 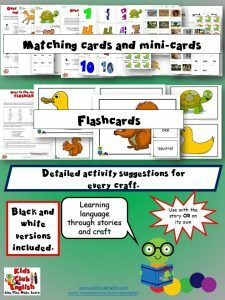 A popular resource, full of crafts and activities to support learning about people, animals, colours and numbers, whilst also building on literacy and vocabulary skills. 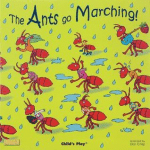 See full description and preview on Mindingkids or TpT. 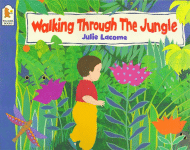 Walking through the jungle is a popular story and song that always goes down well with kids. 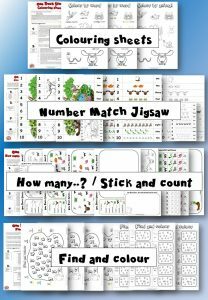 Use these interactive games, crafts and activities to support learning language related to animals, actions, colours and numbers and common language chunks that appear in the song. 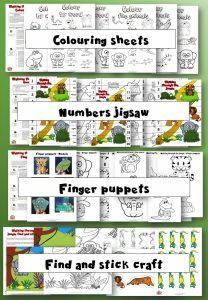 See full description and preview in our TpT store. 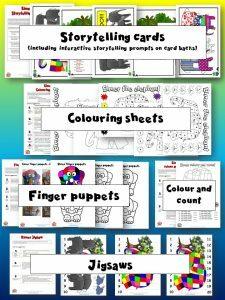 Support children’s learning about colour recognition, understanding patterns, counting, literacy and vocabulary development whilst building on the theme that we are all unique. 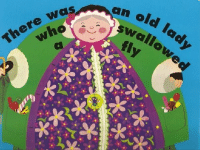 Storytelling cards provide dynamic storytelling opportunities, even if you don’t have the book. 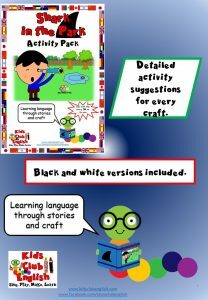 See full description and preview on Mindingkids or TpT. 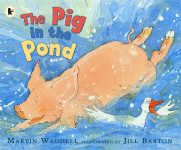 Use with or without the story to learn about animals, support colour and shape recognition, practise counting, introduce sounds, letters and rhymes and build on literacy and vocabulary skills. 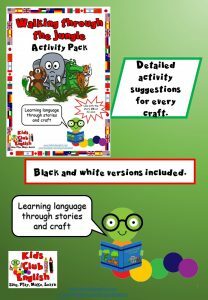 Following activities in the pack, children will also develop fine motor skills through colouring, tracing, cutting and sticking to create the various crafts whilst being encouraged to listen, follow instructions and develop social skills. 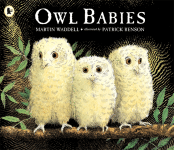 See full description and preview on Mindingkids or TpT. 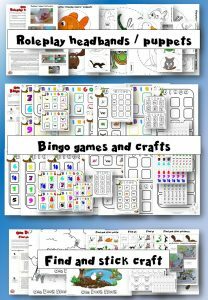 Fun and dynamic crafts and games to support learning language related to animals, numbers, actions, noises, habitats and nature. 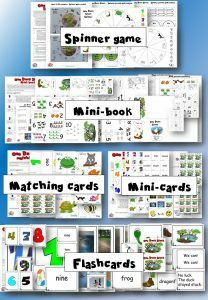 See full description and preview on Mindingkids or TpT. 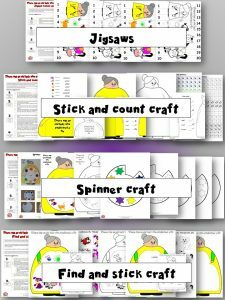 These fun interactive games, worksheets and crafts help children develop language related to people, animals, prepositions, colours and number. 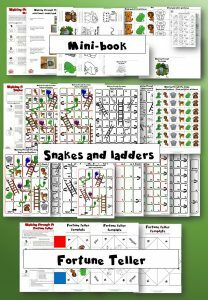 See full description and preview on Mindingkids or in our TpT store. 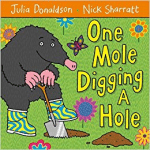 An interactive craft where kids create their own scene based on One Mole Digging a Hole by Julia Donaldson and Nick Sharratt. 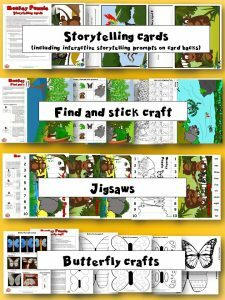 Perfect to work on rhyming, local wildlife and garden vocabulary. 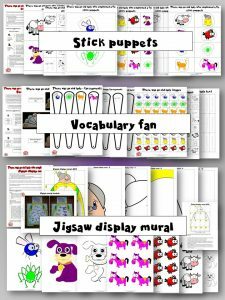 ALSO INCLUDES completed worksheets to use for vocabulary games, and colouring dictations. 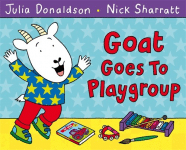 See full description and preview in our TpT store. 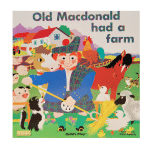 Use these CLICK, CLACK, MOO cards to play games, pre-teach and practise key story vocabulary from the story OR as part of a unit on Farm Animals. 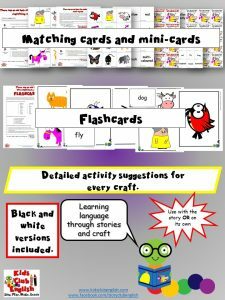 Flashcards come in both A4 and A5 sizes and include image and word cards. 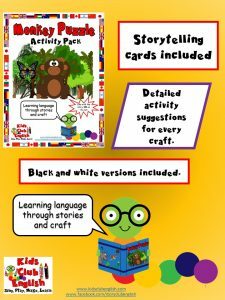 Optional card backs are included and detailed Activity Suggestions. 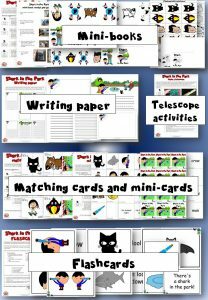 See full description and preview in our TpT store. 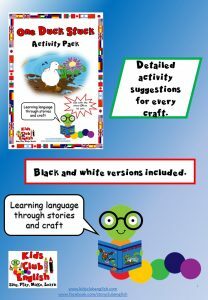 The following 16 page mini-book is a great resource for re-telling the story in a dynamic and interesting way. You can choose between two different variations. The first one allows you to simply print and follow the assembly instructions. 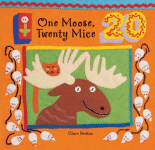 The second can be used in a fun treasure hunt / sequencing activity. Detailed activity suggestions are included. 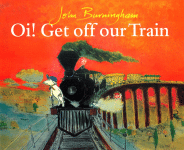 See full description and preview in our TpT store. 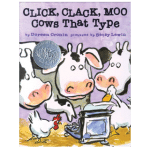 Use these CLICK, CLACK, MOO templates in a follow-up activity to this story or as part of a unit on farm life. 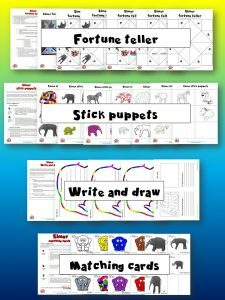 There are a mixture of templates with wide and narrow guidelines for writing practice, as well as drawing templates for a more artistic response! The letter templates are a fun way to practise writing. Why not have your class write letters to you or each other? All templates are available in colour or black and white. 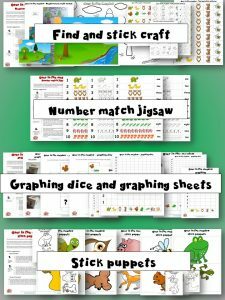 See full description and preview in our TpT store. 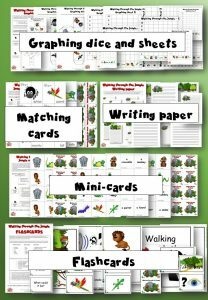 These simple powerpoint games can be used to practise animal vocabulary that appears in the stories. They can be used independently of the stories. Activity suggestions have been provided in the notes section, especially where slides contain only images and it is not immediately obvious how you could use them. 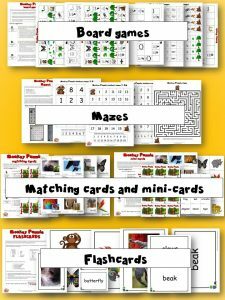 Practise animal vocabulary from the Monkey Puzzle story with these graudal reveal games. 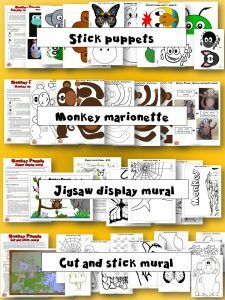 Watch the shapes disappear to reveal the Monkey Puzzle animals. 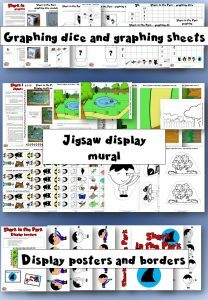 These free powerpoints include colourful images and simplified text. 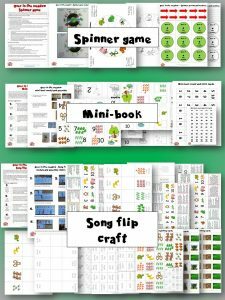 You can use them to tell the stories in a simplified way. 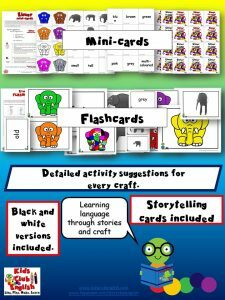 If you are using these in a classroom setting with a projector, you might also enjoy using the slides for other vocabulary and language games. 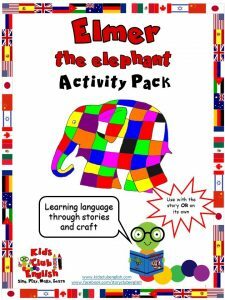 Join Elmer the colourful elephant on his adventure. 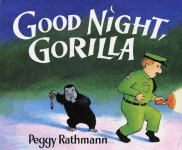 This simplified version includes useful repetition of colours and animals vocabulary.